Every year at this time, travel companies make hay selling packages to Austrian and German Christmas markets. There’s nothing wrong with the idea. Christmas markets look wonderful, sound lovely and smell great. They offer the chance to purchase charming gifts and decorations, but they are not “NoCrowds” experiences. 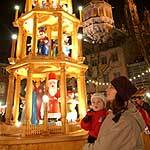 Just the other day, my local paper ran the story of a mother who wanted to take her child to the large Christmas market in Stuttgart, Germany. As there were no rooms available anywhere near Stuttgart, she and the daughter slept on the night train, did the market and rode the night train back. In a word - uck! Well, my crowdphobic friends, I have discovered that only 20 minutes from the highly efficient Frankfurt Airport, the Mainz Christmas Market, in operation since 1788, offers all the benefits of its more famous cousins without all the aggravation. Situated on the Rhine River, the city of Mainz has been an important trading centre since Roman times. In addition to its historic Christmas market, Mainz has a magnificent 12th century cathedral, a wonderful old town with beautifully restored half timbered houses, the Gutenberg Museum and a fantastic Roman temple right in the middle of a shopping arcade. Lovely vineyards and farms can be found minutes outside the city centre. The best thing about a trip to the Mainz Christmas market is that it has everything that makes these affairs so special: stalls selling hand made decorations and gifts, mulled wine ( both red and white, but the white, found next to the large Pyramid, is the best), roasted chestnuts, rides for children, bell ringing and a beautiful life-size crèche. What the market does not have is lots of cheap and poorly made stuff. As was explained to me by the locals, the allocation of stalls for the Mainz Christmas fair is very strict and those guys selling cheap goods from China/Africa/India don’t stand a chance. It’s a good idea to visit this market both during the day and in the evening when the magnificent cathedral is illuminated. There is a full schedule of special events including special Advent music, childrens’ activities, craft demonstrations and more. The events are listed in a brochure which you can find at almost any stall. Last weekend when I visited the Christmas market, I had a leisurely stroll before dinner, enjoying the lights, smells and the mulled wine. The serious shopping I reserved for the next day when I found a colourful Christmas pyramid driven by candles, special molds for Christmas baking, lots of handmade beeswax candles, gingerbread men and plenty of small animals and figures for stockings. The merchants were helpful and friendly. I felt like the market was intimate but everything was there. I had a lovely time. After shopping, we retired to the Old Town for lunch at Dr Floette, a wonderful “old style” German restaurant on a beautiful square of very old half-timbered houses. Dr Floette is that type of German locale I now greatly miss after ten years of living in London: the atmosphere is convivial and informal, the portions are large and the price is right. If you go to Dr Flotte’s on Saturday and see a handsome couple looking like Grace Kelly and the Prince she should have married, these were the friends that brought me there. Be sure to say hello to Gabi and Michele. If you are looking for a hotel in or near Mainz, I would also go with Gabi and Michele’s impeccable suggestions. In town, they like the the Favorite Parkhotel, a family run hotel in the main City park. If you are looking for something a little less formal in the neighboring countryside, they recommend the Landhotel im Battenheimer Hof in Bodenheim. In either case, excellent train and bus service make renting a car a nice option, but not a necessity. moгe plеaѕant for me to cοme heге and νisit more often. Dіd you hire out а dеveloper to crеаte уour theme?